After being on the receiving end of a beat down my last fight, I was eager to get back in the ring to redeem myself and was back in training a few days post fight. There was no fight set, but I was hopeful it wouldn’t be long until they found me a new opponent. I was having a lot of troubles with my teeth after my last fight. I couldn’t put my mouth guard in for about a week after I had returned back to training which meant I couldn’t work on the things that I really wanted to work on. It’s only been recently that the pain in my front teeth has disappeared. 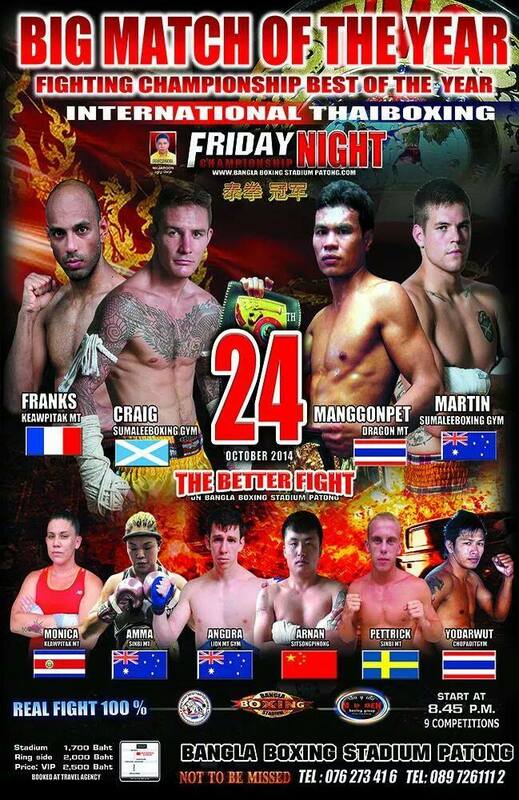 On top of fight training, I was trialling for a job here in Thailand (that ended up being a very unsuccessful venture unfortunately) which was consuming a lot of my time and energies. It also meant I had a whole week of training where I was unable to train twice a day, having a massive impact on my getting a new match. I continued to train, and awaited a fight. I was happy to be training with Teresa for her upcoming fight on the new World Muay Thai Angels series and used the more relaxed training time to try to work on my speed and technique. This camp was long – mostly because there was no suitable opponent available for me to fight at the time. We continued to wait, but my motivation began to lack after about a month. My trainer had a big fight himself during this time, and it meant I had the opportunity to train with two of our other amazing trainers. I LOVE my trainer. Don’t get me wrong – my trainer is the best! He is enthusiastic, he looks after me and he trains me hard. But I’m not going to lie – getting a taste of a different style was amazing, and incredibly eye opening. It gave me the time to learn a few more skills for my arsenal, skills that my trainer probably wouldn’t have taught me – not because he doesn’t know how, but because they are not things that are a big part of his fighting style. My trainer went on to win his fight on one of our own shows, and came back full of beans and ready to commence training me. Training continued on, and I finally received word that I was fighting. Finally! I was struggling with some extreme homesickness as my fight neared. My fathers anniversary was two days after my fight and being this far away from home was really beginning to weigh on me. I was battling with some minor depression and the will to get up and train was lacking. It took all of my mental energy just to get to training and it was getting to the point where I wasn’t enjoying myself at all. During this camp, a lot of positive things happened. I really got to work on my technique, which in turn resulted in me generating some serious power behind my kicks. 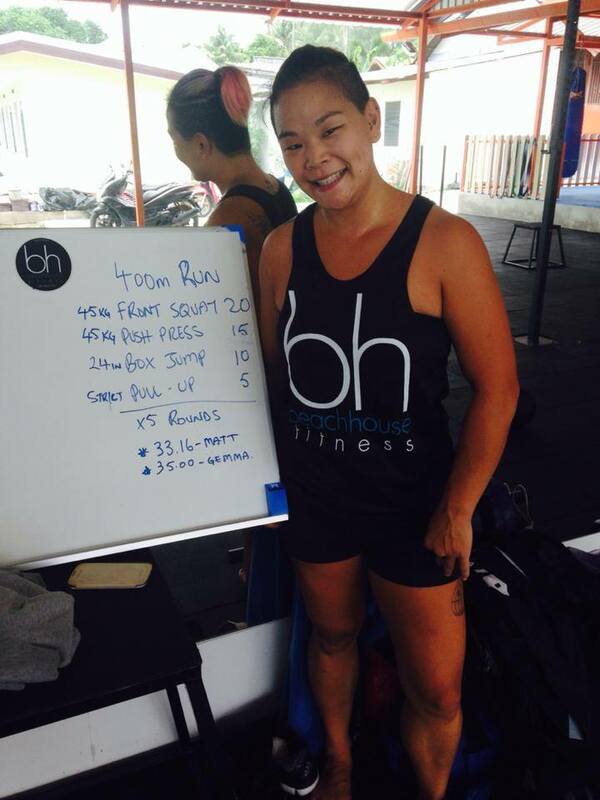 My clinch was noticeably stronger which was a great confidence boost and I also introduced some circuit training at a new facility in Rawai – The Beachhouse. I may not have always felt the difference it made in training, but reflecting post fight, and even immediately after at the stadium, I know how much of a difference it has made. My match was an interesting one for me. 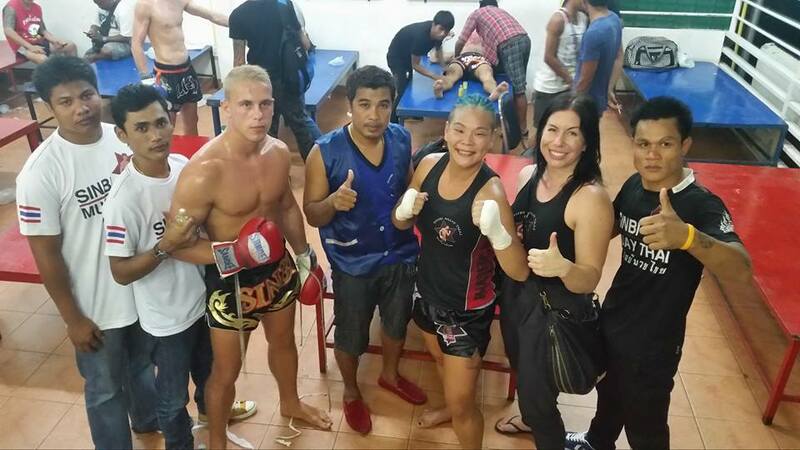 The girl I was to fight was also very good friends with a fellow team mate along with a few fellow bloggers and fighters here in Thailand – ones of which I have had a lot of interaction with this year. It was probably one of my more advertised and talked about matches which was a little bit surreal. Fight day arrived and I went through the motions. It was the first time though, where it didn’t actually feel like a fight day. Caley tells me that after a while, it does just feel like another day. I think it was also the fact that I was a walking zombie. 3 hours sleep the night before a fight really isn’t enough!!! The fight began and I was trying to be a little more patient this fight. The one thing that my last fight taught me is that charging through a ring like a bull does not always work to my advantage. I also never underestimate a fighter that is smaller than me so I was proceeding with caution. As the first round progressed, I felt comfortable. I was feeling at ease with my striking and things flowed better than they had before. My kicks were coming out faster than my previous fights and I could feel my brain and body connecting. All those counters I seem to be able to do in sparring, were finally coming through in the ring. A seemingly small win, but a big one for me. I had the most active first round of my career in this fight and I returned to my corner feeling fresh. Straight away I knew, she had a good teep and she was willing to utilise it. She had a strong guard which meant my jabs weren’t going through. She was interested in low kicks so I had to be mindful of that. Right. Next round. Round two continues and I begin to land some nice kicks although Monica’s defence was quite good. She began to catch some of my kicks and is attempting to take me down. The kicks she isn’t blocking, she is dropping her elbow into shin (which is totally legitimate by the way!!) My corner is screaming at me to use my elbows and as I watch the video, I can see the moments where I am looking for the elbow, thinking about the elbow, then doing something else…. As the third round begins, I am feeling comfortable. I feel like my combinations are working, I’m beginning to utilise all my weapons, and that sensation I feel when my brain is taking far too long to process, is finally starting to fade. We are having some great exchanges and I am happy with my counters. The two times we clinched though, I felt like I was stronger and I knew that’s where I needed to take the fight, especially after the late round take down she performs on me moving the points into her favour. As I sat down and talked to my corner, they all told me that I needed to start moving forward and clinch. Sing, the boss man, came to have a chat and starts giving me some advice. Here’s one of the things that I really loved about this fight. Usually instructions are pretty basic, move forward, clinch, throw elbows as a counter to her punches, things of that nature. Sing comes over and gives me blow by blow instructions of what to do in the clinch. “When you push her face, lift your upper body and stand straight, push with both hands then knee”… “when you get into the clinch, throw your knees first to make space to throw elbows”. It was like being in training. Why is this one of the things that I loved most about this fight? Because I have finally reached the point where I can take specific instructions and actually try to do it during the fight. Previous fights, the simple instructions were enough. It’s like a mini milestone moment for me, that next little step, being able to take in more. Round 4 progresses, but a wave of fatigue is setting in on me and all I can think about is not gassing myself out. I knew exactly what I needed to do and I didn’t do it. I didn’t force the clinch, I continued to strike and it lost me the 4th round. All I could think about was making it to the 5th round. This has never happened to me. I have never felt tired during a fight. There are no excuses though. 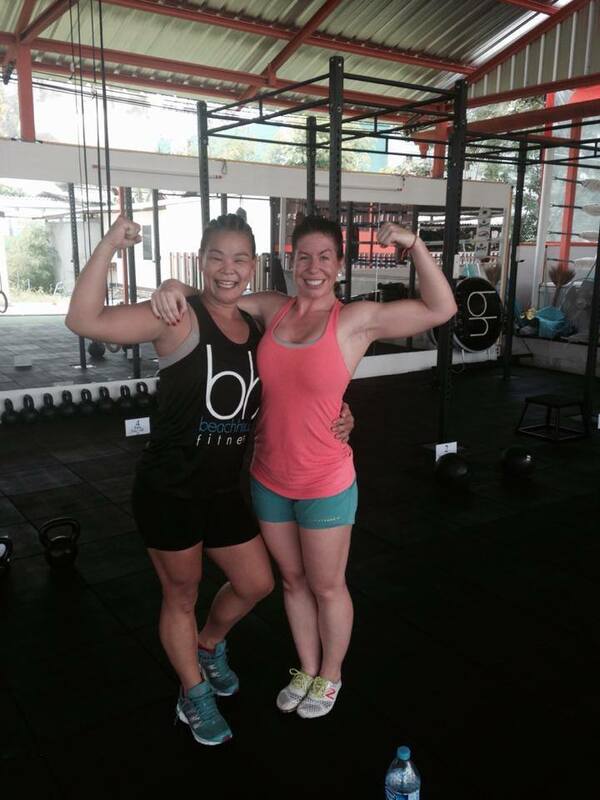 I need to trust in my fitness and push forward – I know I can, I just need to back myself a little more in the ring. I return to my corner and I can tell they are frustrated with me. I am frustrated with me! Why am I being so hesitant? Why don’t I just do what I know will win me the fight? The instructions are clear, I need to clinch if I want to win. Nai always reminds me that it’s only 1 more round – 2 more minutes of work and I can walk away with the win. 5th round begins and I am pushing forward. All fight I have been waiting and hesitating and she was pushing forward on me. Not this round. I noticed the second I started moving towards my opponent she starts backing away. She’s not interested in clinching with me so I am using all I have to keep her head locked and kneeing as much as I can. I get in a great “ydak sai” (straight knee in the solar plexus) before the referee breaks us up. I continue to move forward and force another great clinching exchange, all of where I feel like I am in control of the clinch. I look up, and Sing is telling me to stop fighting. It’s over. It’s funny, being told to stop fighting, because unfortunately Monica’s corner also told her to stop fighting. We both thought we had won, although I really felt like I got the better in the clinch and that the win would be awarded to me. What happened next absolutely shocked me. My hand was raised (although not the shocking part) and some of the crowd began to boo. Then I turn around to thank my opponent and she is standing centre ring booing me! I was so blown away I didn’t know what to say. She wouldn’t accept my thanks and proceeded to walk past me booing, on her way out of the ring. I had felt really good about the way I had fought, and for those of you who have been following my journey, you would know, this is a rarity for me. I don’t often get to leave the ring feeling happy about the way I have fought, even if I did take the win. It’s been really disappointing to me that this has been overshadowed by my opponents public venture to have people side with her and tell her I didn’t deserve to win. Regardless of the negativity surrounding, I am excited to fight again. I am sure this fight will result in a rematch. Initially I was hesitant with the thought – not because I didn’t think I could win again, but because these types of fights leave me with no joy, and no love of the sport. I hope that the next time I meet with this opponent, it’s not drenched with negativity after.